Beautiful 3 bedroom, 2 bath home with den. Canal-front with included boat dockage, private backyard and a large swim spa. Den can be closed off for 4th bedroom. Internet included along with central AC, Direct TV, linens and checkout cleaning. Only minutes from Key West. 50' Dock. Great for boating or exploring the wonderful area of Key West. Renters must be 25 years old or older. No pets allowed. The house was amazing, enough room for 6 adults and two kids. Close enough to key West and all The activities. Had problems with washing machine but owner dealt with it promptly. Loved the fenced yard for the children. We all enjoyed the swim spa. We had such a fantastic time!! The home is very well stocked of everything anyone would need -- bed linens, pots/pans, dishes, towels, barbecue, an incredible spa, boat dock, etc.! The list could continue!! Renting thru Matt was such a nice experience. He accommodated us and worked with our last minute reservation!!? Would highly recommend this beautiful home to anyone. We are already planning our next trip. Thank you Matt. Perfect home for just about everything. The layout is very inviting, the house was very clean, everything you might need is there for you. i mean. from the towels to extra sheets, napkins, paper towels... everything. The rooms are all great in size and clean. the kitchen is big and lends itself to entertaining. all the appliances are great. the outside oasis is just that, an oasis. the hot tub "pool" is huge. The patio deck was very large as well. We had one minor issue with the toilet and the owner Matt called us back right away and had someone out there to look at it and fix it. I highly recommend this home and will be back again next year if its available. The house was perfect for our family boating vacation in May 2015. The owners were easy to work with and were helpful with any questions or minor issues we had during our stay. The kitchen was well-stocked and we enjoyed having the house and back yard wired with speakers to listen to music during the stay. The grill and swim spa were nice amenities as well. The fenced tropically-landscaped yard was safe for our 4-year-old to play in while we were cleaning fish or the boat. The location of the house is ideal for boating and fishing. The free public boat ramp nearby was easy to use and we were able to park our trailer in front of the house with no problems. The dock out back had power and water which made cleaning the boat and charging trolling motor batteries easy. 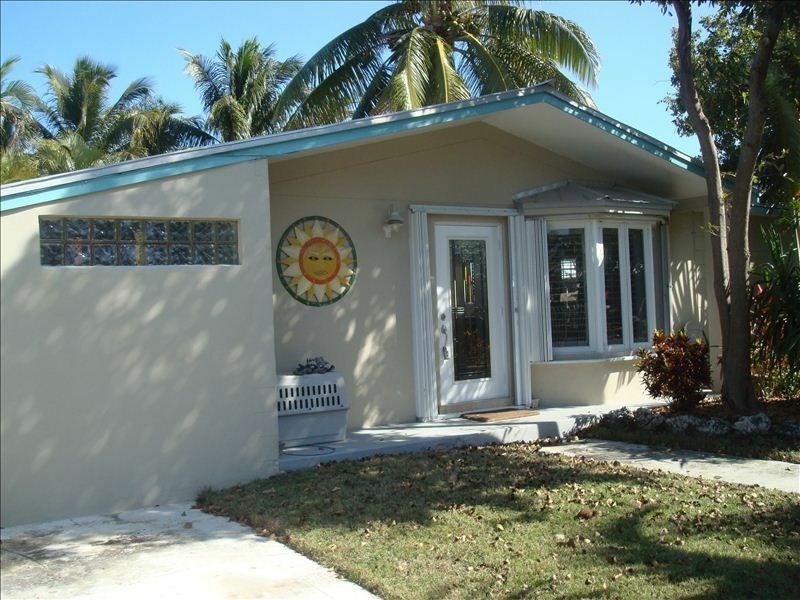 The house has great access to the back country, the ocean side and Key West. Great fishing all around including at the dock where our son caught mangrove snappers and even a hogfish. (Live shrimp and some chum were key for the sea wall fishing.) The restaurant Roostica right down the way on Stock Island was our favorite meal out during our stay. We cooked plenty of mahi and other fish we caught on the grill most nights. The only thing the house is missing is a fish cleaning table so bring a large cutting board or a portable filet table. Otherwise, the house suited our needs perfectly. We will definitely be back for future boating vacations. Checkout cleaning and tax included in rental rate.